When you have the spirit to party and you want to illuminate your festive evenings and amaze your friends and guests at home and your customers at a bar or restaurant, why not use these glow shooter glass 1.5 oz for all your special occasions. 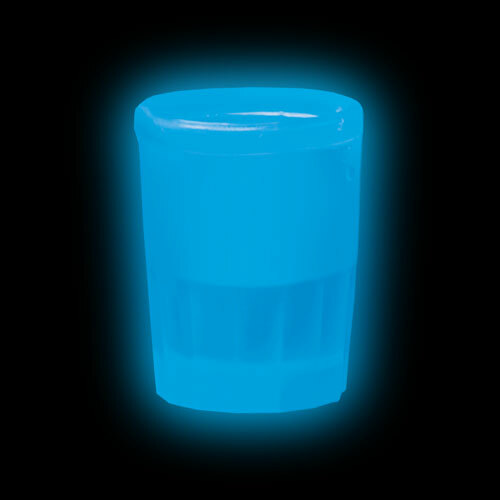 Being blue, this glow accessory is great for blue themed parties like Saint Jean Baptiste day , brithday parties, bachelorette parties and parties of all kinds. To activate the glow for a period of over 6 hours, the glow liquid must be activated by pressing the shooter strongly on a rigid surface. Made of white plastic, this festive accessory 1.5 oz is sold individually and is not recommended for children under the age of 5 years old.